The Christmas season is right around the corner. 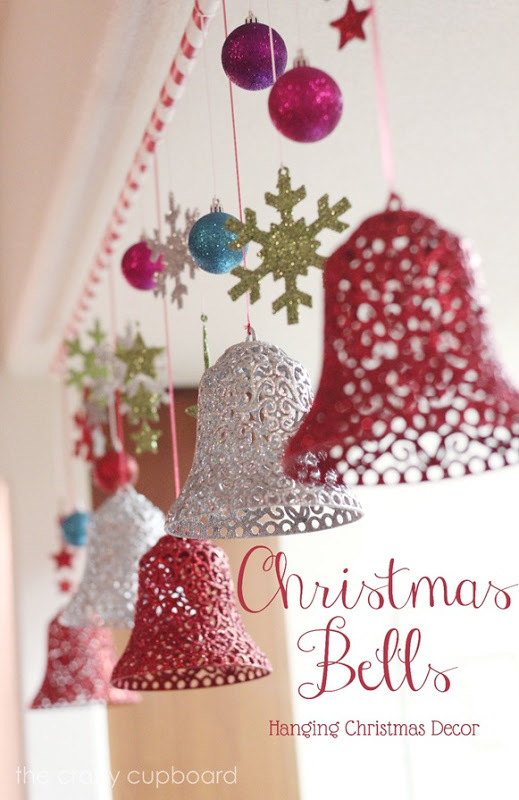 Are you going to decorate your home for Christmas now? If you’re struggling to find the creative decoration ideas, check out these homemade Christmas decoration ideas & tutorials. 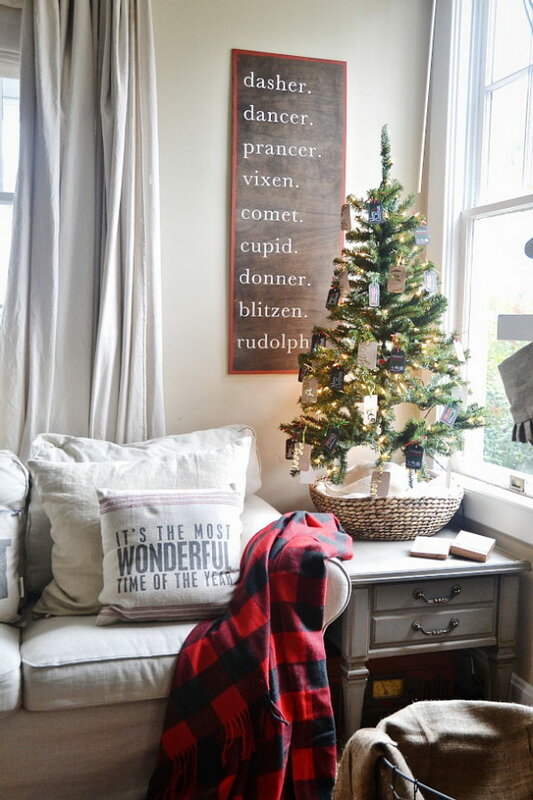 From Burlap Christmas Wreath or DIY Christmas Reindeer Sign to DIY Christmas Tree Cones or DIY Peppermint Candy Topiaries, these ideas would surely add festive air and cheer to your home this holiday season. Tutorial via stone gable blog. 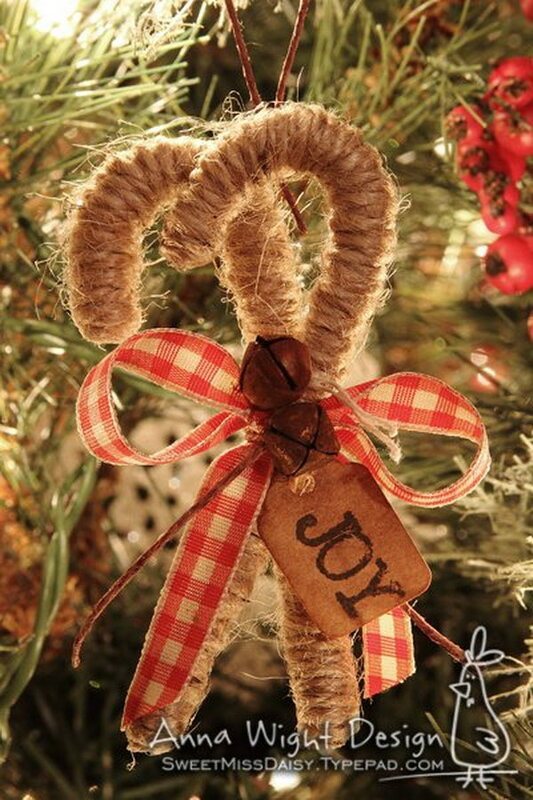 This burlap Christmas wreath is quick and easy to make. 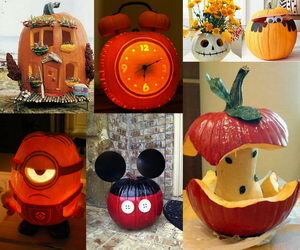 It will make decorating the front door of your home fun and as budget friendly as possible! Get the tutorial via love of family and home. 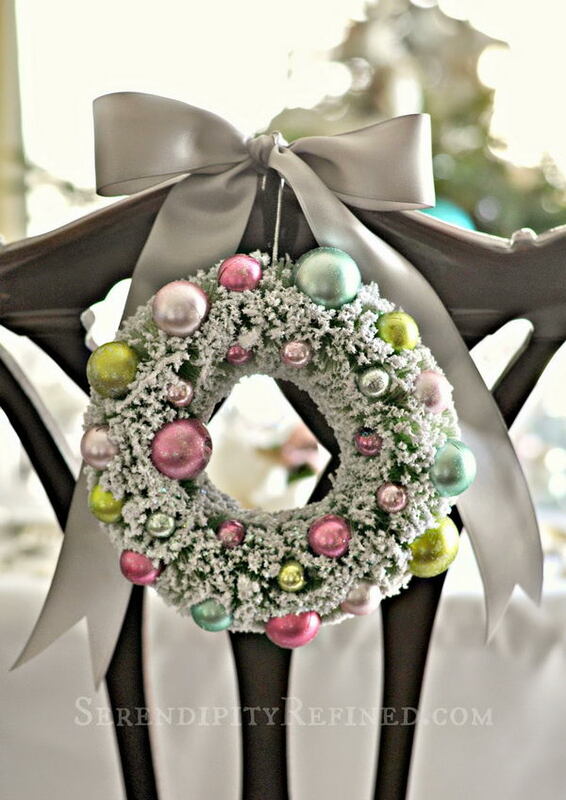 Dress up your chair back with this exquisite pastel ornament and add elegant look and instant charm to your holiday decoration! Tutorial via serendipityrefined. Handmade pine cone garlands! Love its rustic look for decoration at home. 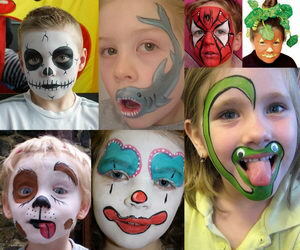 Super easy crafts that can get your kids involved in. Tutorial via UK Craft Blog. For your Christmas decor, try making this wooden reindeer sign to add a homemade touch to your home! See the directions via Lizmarie Blog. Easy dollar store DIY Christmas tree for Decoration! 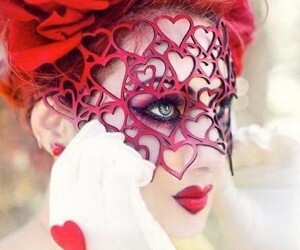 See the tutorial vai Fynes Designs. What you nedd are silver spray paint, spray adhesive, silver glitter and epsom salt for this decoration project – super cheap and beautiful iced branches which are great for this winter season. Tutorial via In My Own Style. 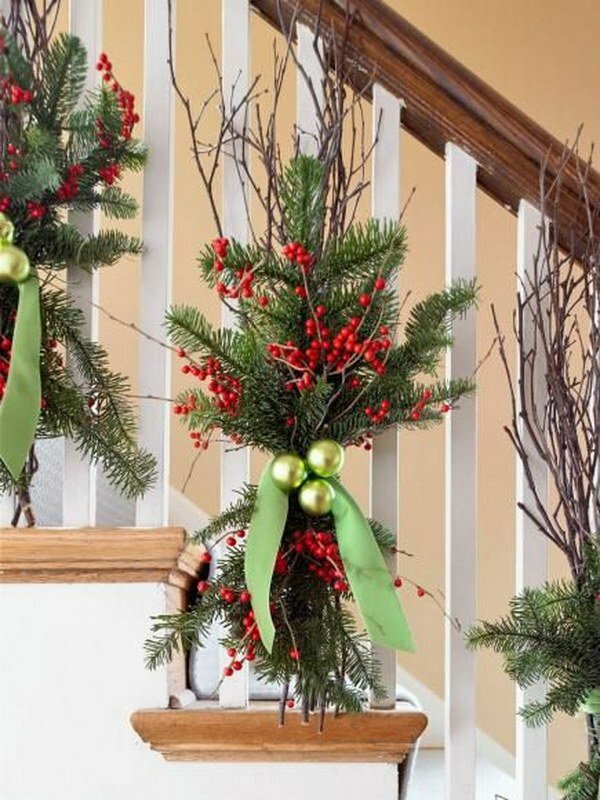 Quick and easy winter decorations with evergreens, chartreuse ornaments, twigs of bright red winterberries, and a velvet ribbon for your steps, mantel decoration. More details via Midwest Living. Super simple and inexpensive Christmas wreath. Look perfect on your front door! Tutorial via All Parenting. Fun Christmas crafts for kids to make! See the tutorial via elementaryartfun. 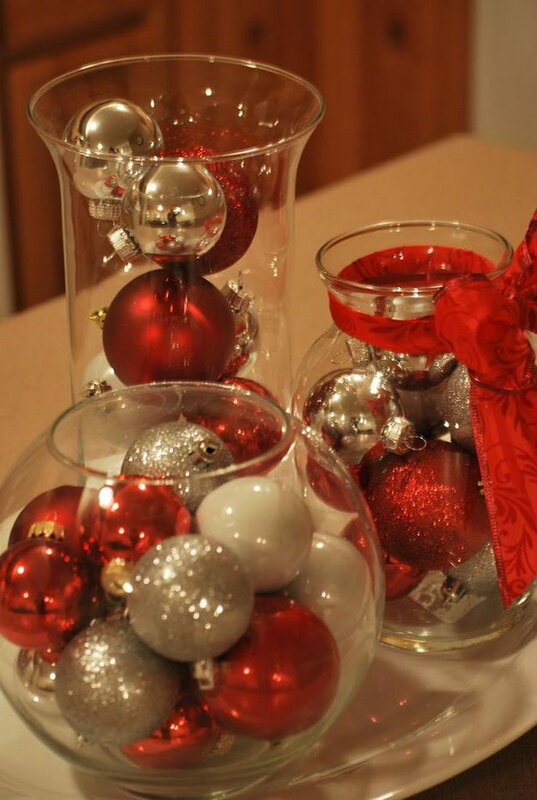 Perfect Christmas centerpiece you can make on a budget. Only take a few minutes to make. See the details and tutorial via Frugal Wife Wealthy Life. Create these easy but festive candy cane ornaments to light up your Christmas tree! See more details via sassy&sweet. 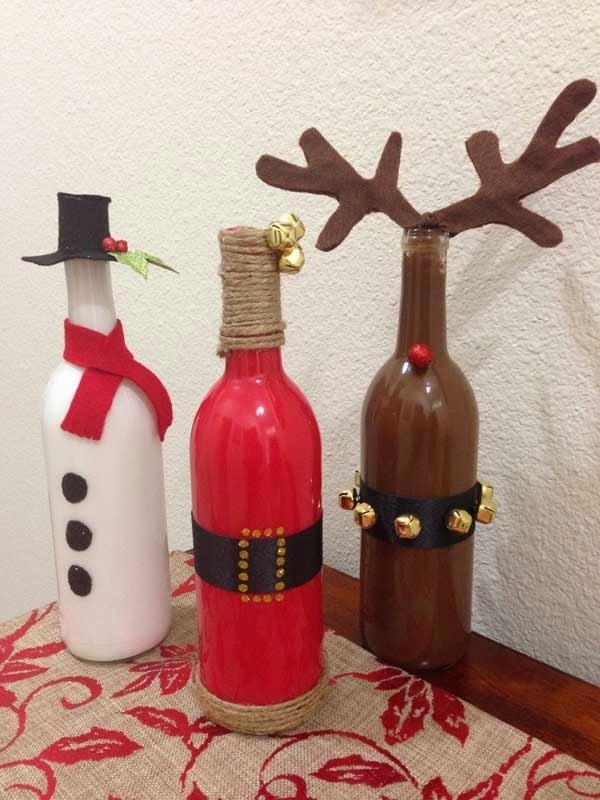 Take several empty wine bottles and spray paint them and dress them up as snowman, Santa and reindeer. 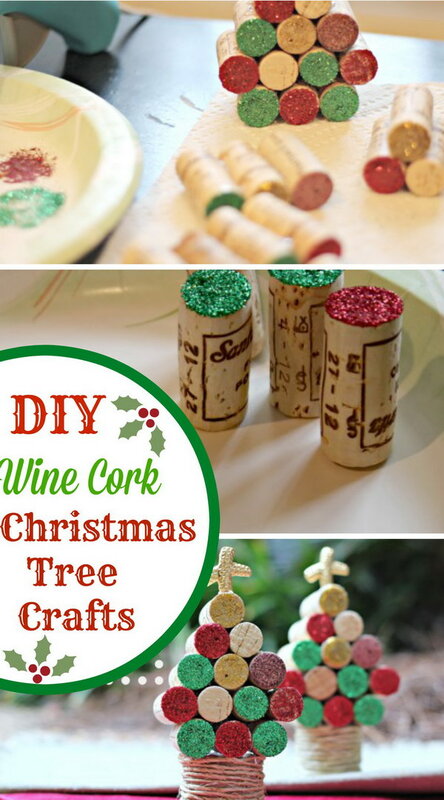 Very cute idea of creating a festive holiday decoration with wine bottles. source. 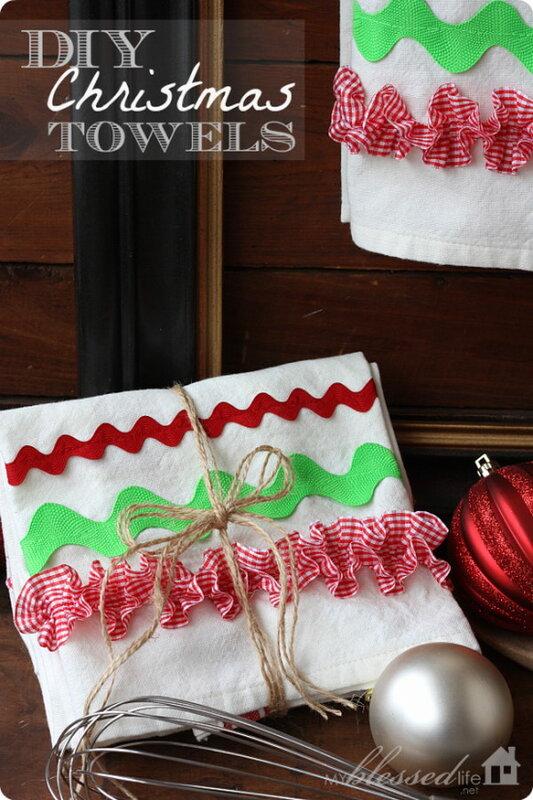 Adorable DIY Christmas gifts or make for your own kitchen. Only take you several minutes to make. See the tutorial via My Blessed Life. 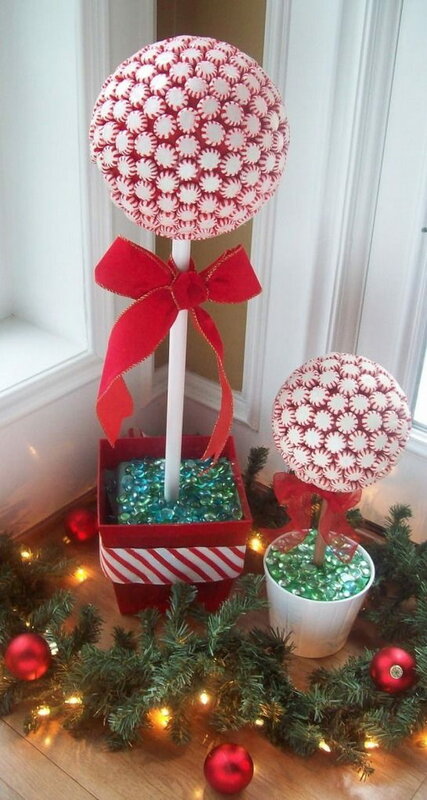 Use hot glue to create peppermint candy topiaries for Christmas decor. Tutorial via bystephanielynn. 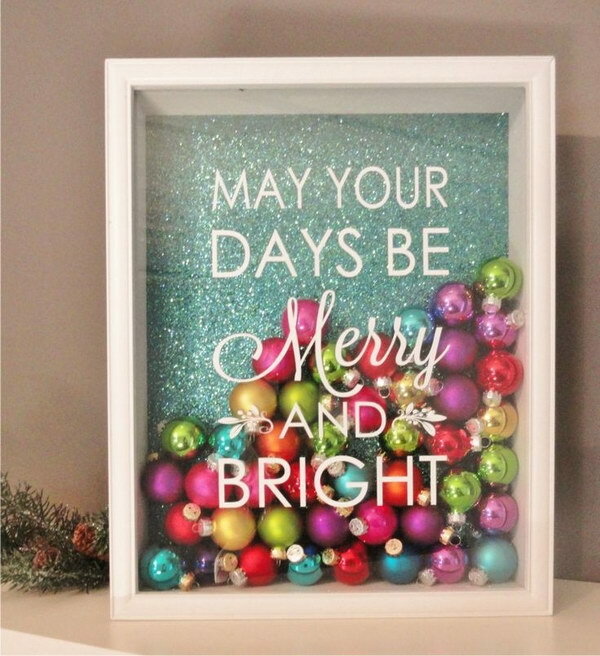 Fill a shadow box with little ornaments in various colors and also add a glittery paper backdrop. You can hang this on the wall for the holiday decorations. source. 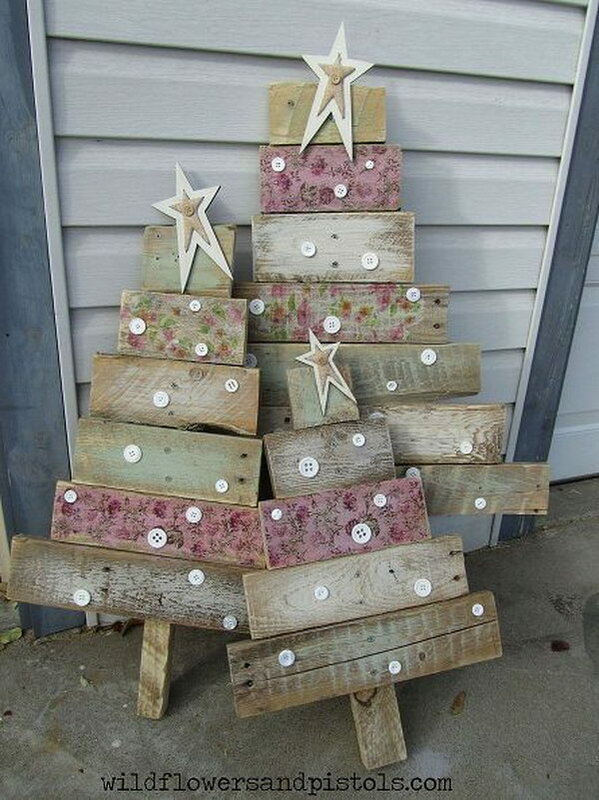 Made these Christmas trees from reclaimed wood and old pallets for your Christmas decoration. See the tutorial via hometalk. 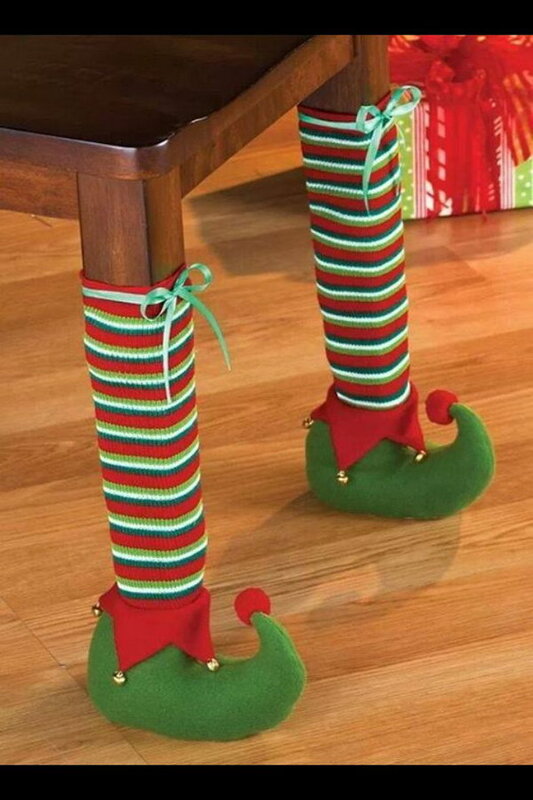 Dress your table legs like this for a merry reminder of Christmas. Super cute and adorable and also easy to do! source. Decorate with lights and add warmth this holiday season. These globe light winter luminaries are just for you! source. 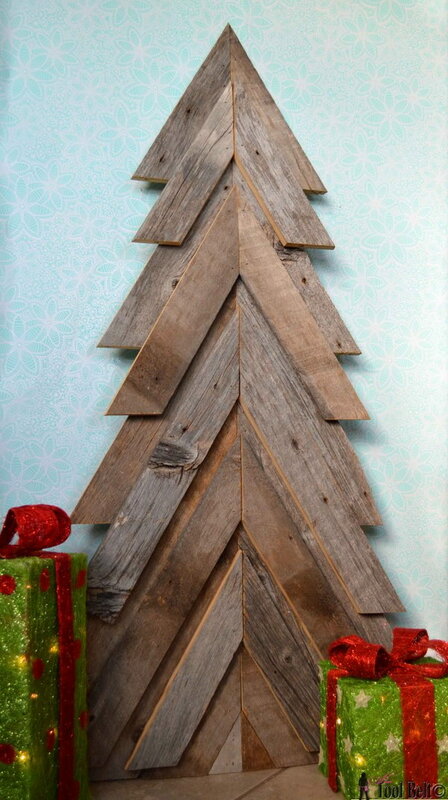 Add natural elements into your Christmas decor with this rustic Christmas Tree from pallets or barn woods. 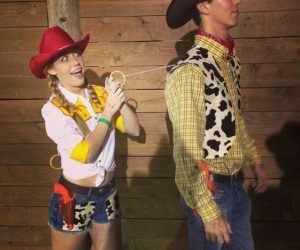 Get the tutorial via Her Tool Belt. 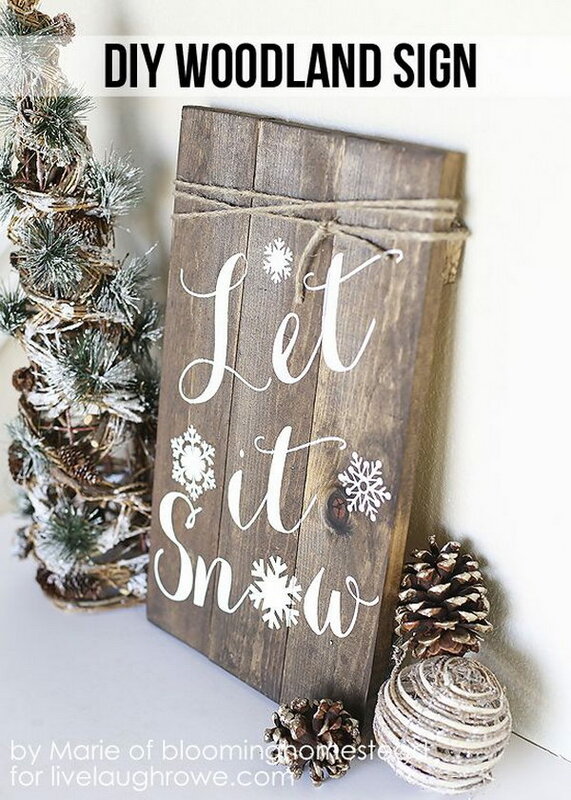 Love the rustivc look of this fabulous DIY Winter Woodland Sign for the upcoming holiday. See the tutorial via Live Laugh Rowe. Add a festive look to your holiday with this simple and cute Christmas craft! See the tutorial via Pink When. Dress up your entryway with this ornament mirror project this holiday season! Tutorial via marthastewart. See the tutorial vai thegraphicsfairy.